Whatever level your band is at, chances are you've experienced a volume war during rehearsal at some point. It's nobody's fault, really, but it may have to do with the musicians and equipment being in the wrong positions. Each band member must be able to hear what he or she is playing, and also hear what everyone else is doing. 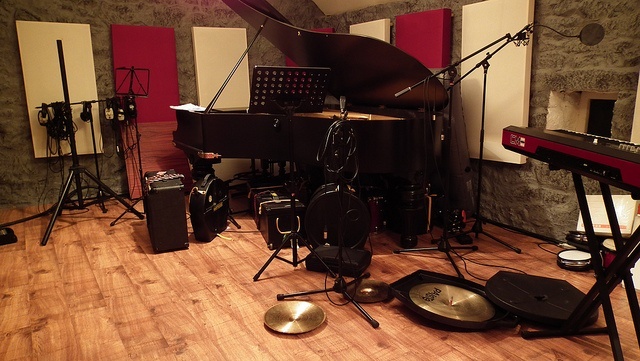 Unless you're a studio-only band, chances are, you'll need to replicate a live setup as best you can. If you practice in the infamous inward-facing circle, everyone will rely on visual cues and be standing at the center of the sound too much. When you practice, position the band according to the stage diagram below, and keep these tips in mind for each band member while you rehearse. The drummer is probably going to be making the most noise out of anyone in the band and will always be able to hear what he or she is doing. The problem is that it's unlikely that the drummer can hear what the rest of the band is doing over the drums themselves. During rehearsal and in gigs, it's most important that a drummer can hear the bassist. While the other instruments are important, too, without the bass, the drummer's going to have a harder time knowing if the band is off tempo. That's why it's imperative for the bass amp to be really close to the drum kit. Position the bass speakers on one side of the drummer, and have them face the imaginary audience. Bass frequencies tend to spread outwards rather than project in one direction, so as long as the amp is close to the drums, the sound will be heard clearly by the drummer and by rest of the band to an appropriate degree. The bassist should stand near the front of the stage in a spot where he or she can hear the amp. A guitarist needs to stand where the bass can be heard best, on opposite side of the stage from the bass amp. The guitarist's amp needs to be on the same side as the guitarist on the stage, but also near the drum kit. This will allow the guitarist to hear him- or herself and the rhythm section, while also projecting to the pretend audience. In a live gig, the keyboards will likely be projected to the audience via PA. If you prefer to use an amp while playing keys, then you may want to project towards the band for rehearsal. In a live gig, the keyboard amp should point towards the keyboardist. The band will be able to hear the keys through a monitor and the audience will hear them through the PA. For rehearsal purposes, it's most important that the keyboardist can hear what he or she is doing and be near the bass and drums to help maintain the rhythm. For rehearsal, the vocalist is best off standing towards the front to try to get a good mix of the sound. Since the audience is only pretend in rehearsal, it's okay for the vocalist to put a monitor close by and have it project towards the band. Of course, if an instrumentalist is singing, then all you'll need is a well-placed monitor or two facing the band. It's important that your rehearsal accurately replicates your performing experience. The last thing the band needs is a dramatic change from what they're used to when they play live. 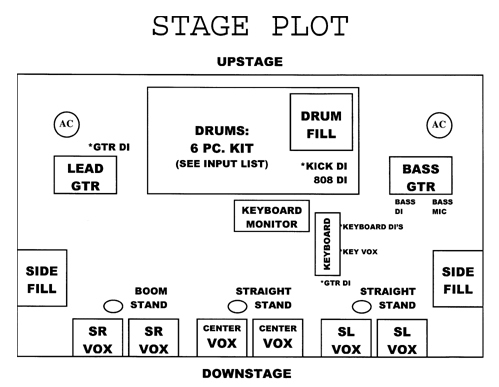 If the stage plot above looks nothing like your band, there are plenty of them out there. The most important thing is that your rhythm section is able to hold it together while still being able to tell what the rest of the band is doing.